Three features i have missed in enlightenment from previous systems i have used are the ability to cycle through wallpapers from a folder, a photo frame gadget for photos that don’t work as well as a wallpaper and a good system monitor gadget. I have finally found a way to do all these using external programs so I thought i’d share them with you. I’ll start off with setting up each program then go through how to lauch any program on startup and turn any program into a desktop gadget. I discovered Variety a few weeks back thanks to this blog on openSUSE News having looked at its website I discovered it clamed to support enlightenment after a couple of packaging issues I had it installed and working, but on my work machine with 2 screens and 16 Virtual desktops I noticed that it was only updating on 1 screen and not all Virtual Desktops at the same time, so i raised a bug then i started looking at the code to fix it. This was simple as variety uses a bash script to do the actual wallpaper change, I made a couple of simple changes that seem to have fixed the issues, firstly I i backgrounded the calls to enlightenment_remote, because sometimes they don’t return quickly, the second change i made is using xrandr to determine the number of screens and using this info to set the wallpaper on all screens rather then just the first. I have included the relevent part of the script below and the full script is avalible as at http://bazaar.launchpad.net/~simotek/+junk/MultiScreenSupport/view/head:/data/scripts/set_wallpaper it will be included in variety 4.21. # -desktop-bg-add OPT1 OPT2 OPT3 OPT4 OPT5 Add a desktop bg definition. Run variety for the first time to configure it. You can reconfigure by running variety –preferences from the commandline. Add variety as a startup application or put variety in your startup script, see below. You can go to the next wallpaper by running variety -n from the commandline. -z randomises the order the images are displayed -g sets the size and the final two options set the time photos are shown for before changing and the background color. Make feh.sh executable, chmod +x feh.sh or use your favorate file manager. 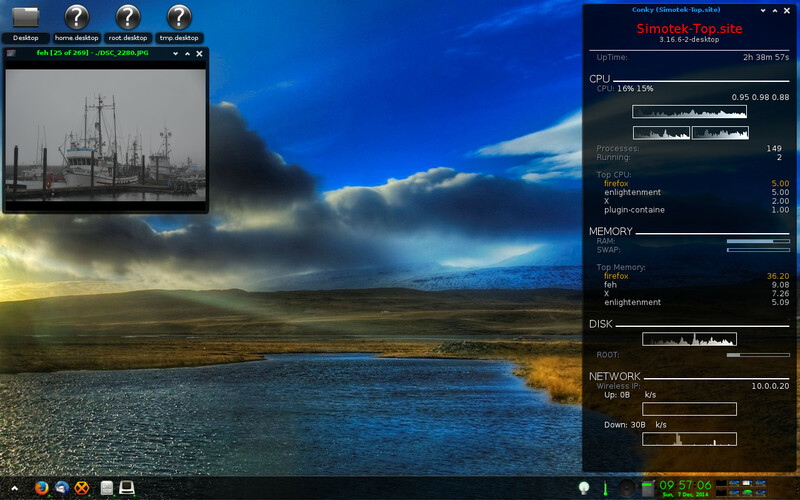 Conky is a very flexible system monitoring application that has been around for quite some time. Using google you will see there is a huge number of configurations. The conky config file is capable of setting all the window flags and positioning required without setting anything from enlightenment, that is what i did in this config from a older blog post I have found that the positioning doesn’t work well with multiple screens so I have been using the following config file you will need to rename it to .conkyrc, and put it in your home directory. 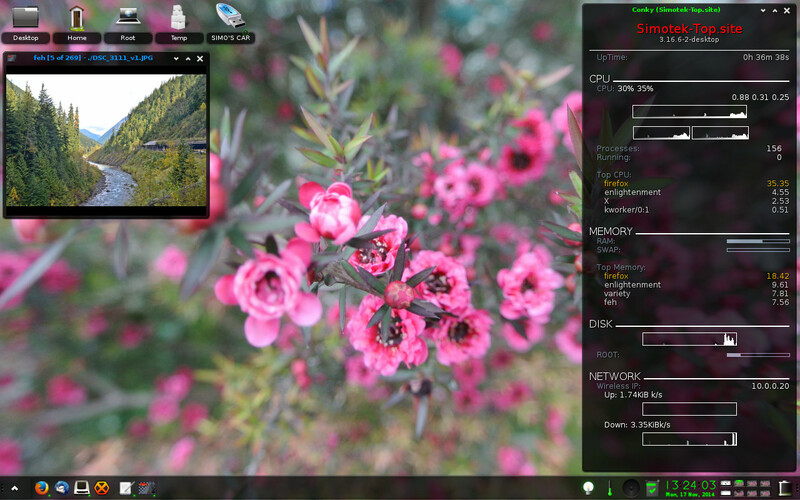 Add conky as a startup application or put conky in your startup script, see below. Enlightenment lets you start any application on startup through its “Startup Applications” setting, there are several scripts that I like to run at startup, one to lauch a synergy server and another to launch feh as above amongst other things. I have put a example below that launches all the programs above. Generally enlightenment recognisise applications by the .desktop file that ships with them, to make enlightenment recognise our script we need to create a .desktop file for it, fortunatly enlightenment makes this easy with its add Personal Application Launcher dialog. 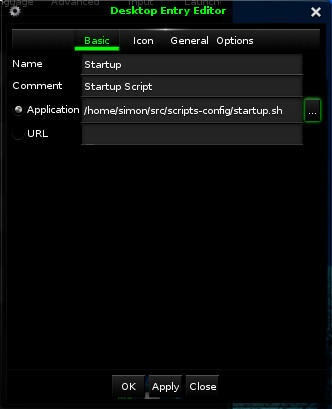 The Personal Application Launcher can also be used to add a script to the ibar. Create a bash script with the above code called startup.sh. Set the Application to the full path of the startup script just created above. Set the icon if you feel like it (useful if you want to run the script from the ibar). For most applications you will need to start with the following, conky you don’t need to as they are set in the config file. 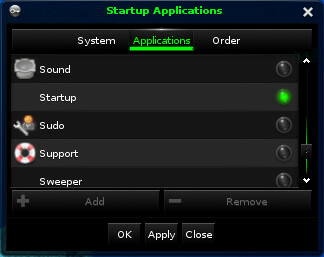 All these options can be found by right clicking on the window border.